Today’s Maximumble can’t take it. Ah! The fearsome airplay ninjas strike again! There is a song out there that will cure all ear worms. It is truly horrible, so I won’t tell you what it is – ANY ear worm is preferable to that! 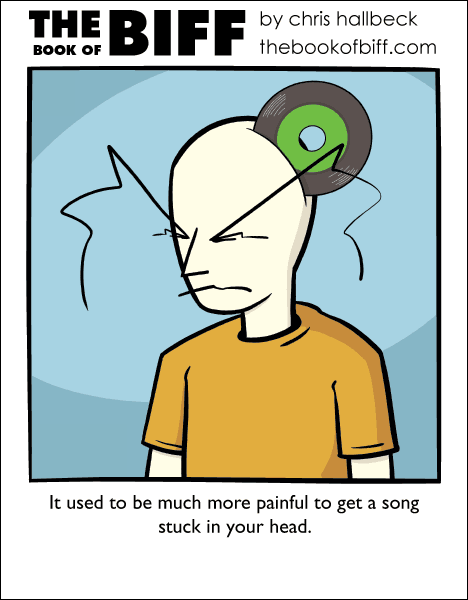 Ahh…Ear worms. I get a nasty case of them, especially if I discover a song with a danceable beat or it’s something that sets the tone for my relaxation. I get earworms all the time, and I really mean it! I listen to music all the time, and the only exception is when I’m playing video games (and maybe when I sleep, I dunno…). My brain isn’t used to silence, I really have to listen to something! The songs that are most prone to getting stuck in my head are songs that I haven’t heard for a long time, but that I still pretty much know by heart. This happens very often with video game music, for example the theme in a Little Big Planet level (“Skating With The King” or something like that) or the background music from various Pokemon games. I get the pokemon BG music ear worm all the time. Mostly because I just got White. Really? What colour were you before? As a child, I used to be able to get rid of an earworm by whispering the lyrics (if the song had any) to a pet. Then I found if I repeated shorter and shorter bits of the song in my head until it became meaningless, I wouldn’t have to think of it any more. That doesn’t work any more, unfortunately. I don’t know anything about being born and raised in west Philidelphia. So you haven’t watched Fresh Prince In Bel Air, then? A couple times, but I don’t know most of the theme song lyrics, possibly because it wasn’t a show I enjoyed/watched much. Wha-…? Your picture changed! At first I didn’t read the name, so I thought that it was another person! They can be useful, though. If I hear that somebody once lived in the Bay Area in the 70’s, I might say, “Dublin-Berkely-San Lorenzo….” to see if they add “Cupertino-San Jose.” Even better if they sing it. Old ad jingle for a local chain of stores to help the viewer remember where the locations were. Gilligan’s Island theme played on bagpipes. “In west philadelphia born and raised…” is going to haunt me for the next 24 hours at least. Crush 40 music always get stuck in my head… is that bad? No, my parents are stuck with Crush 40’s Open Your Heart. I ingrained in them when I obsessed over Sonic Adventure coming out on 9-9-99.